Category Archives for "strengthening core"
Up to 80% of individuals will experience some lower back pain at least once in their lifetime. Lower back pain (LBP) results in high costs and places a burden on society. These costs include diagnostic, treatment, and indirect costs associated with work disability. A number of conditions can lead to low back pain such as infections, tumours, fractures or dislocations of the spine. However, lifting heavy loads is generally thought to be a key predictor of LBP. An important element in prevention of LBP is to correctly stabilize the trunk during lifting by pre-activating the abdominal wall muscles. By doing so, the spine will increase in stiffness to reduce the effect of undesired spinal perturbations. Exercises aimed at bracing the abdominal muscles may reduce the risk of LBP. There are two ways of stabilizing the abdominal muscles: an abdominal hollow or abdominal brace. 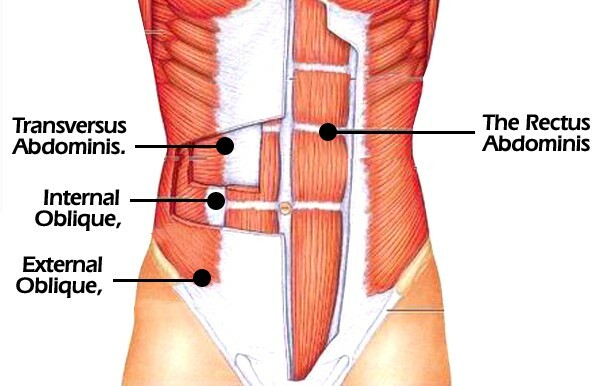 An abdominal hollow begins by drawing in the lower abdomen (transversus abdominus) while maintaining relaxation of the other surrounding abdominal muscles such as the obliques. At the same time, small muscles of the lower back (close to the spine) such as the multifidus are contracted while the larger back muscles are relaxed. With contraction of the lower abdomen and small back muscles, intra-abdominal pressure is increased and the fascia surrounding the spine increases in tension. Combined, these contribute to provide intersegmental stability. An abdominal brace is performed by activating all of the abdominal and lower back muscles, rather than specific muscle recruitment. By tensing the entire trunk without drawing the muscles in or pushing them out, global activation of the ab and back muscles may provide increased stability in all directions in various movement patterns. Your core muscles help strengthen and stabilize your spine and pelvis, which is why developing a powerful core is the first step to making your whole body stronger. Start firming up your core with these gentle Pilates-based exercises, which will give you a solid foundation for all other movements. Perform 15 repetitions of each exercise, most days of the week. Lie flat on back with knees bent and feet gripping floor, arms facing down at sides. Raise right hipbone as high as you can toward ceiling. Hold momentarily. Slowly shift and raise left hipbone. Gently sway from right to left, as if you have a bowl of soup between your hip bones and you’re gently rocking it without spilling. Counting right and left as 1 rep, perform 15 repetitions. Lie flat on back with knees bent and feet gripping floor. Lift hips up toward ceiling in bridge position, and place thumbs on ribcage with middle fingers on hipbones. Tilt pelvis toward ground, expanding distance between fingers and thumbs. Next, tilt pelvis upward, decreasing distance between fingers and thumbs. The two movements from downward to upward should complete 1 breath cycle. Perform 15 cycles. Sit upright with arms out in front of shoulders, elbows slightly bent. Round back softly, and slowly roll backward, imprinting lower back (lumbar spine) then mid-back (thoracic spine), and lastly upper back (cervical spine) down into cushioned mat. Once rounded all the way down and head and neck rest on mat, grab behind hamstrings to assist yourself back to upright seated position. Perform 15 repetitions. 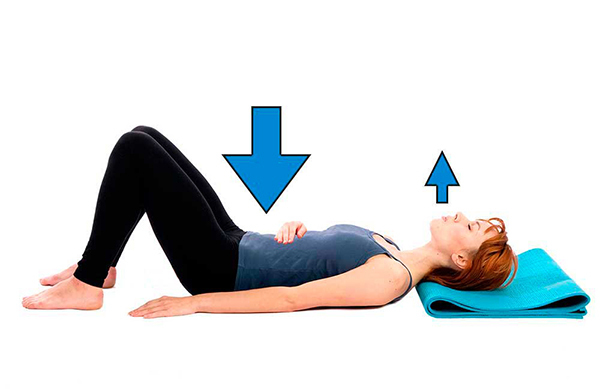 Lie flat on back with arms at sides and knees bent to 90 degrees, hovering knees directly over hips and shins parallel to ground. Engage abs to lift head, neck, and shoulders off floor. Lift arms, depress shoulders away from ears, and reach fingertips away from you. Begin pulsing arms down and up. Complete 5 pulses on an inhale, then 5 pulses on an exhale. Perform 3 breath cycles like this. Start on all fours on mat with knees hips-width apart and hands directly beneath shoulders. Exhale and round back toward ceiling like a cat, head drooping down. Pull navel in toward spine. Hold momentarily. Inhale and drop belly down toward floor, lifting head high. Allow ribcage to expand and chest to stretch. Hold. Perform 15 cycles.